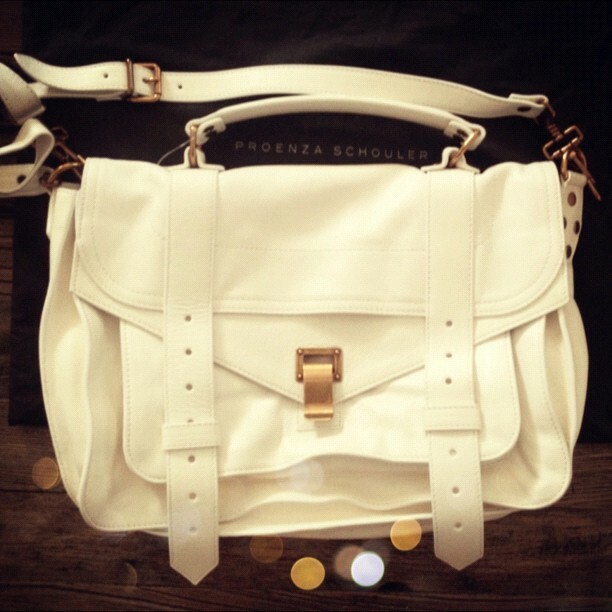 I’ve long had my eye on Proenza Schouler’s covet-worthy PS1 bag. Since its debut four years ago for Fall 2008, it’s been steadily rising to icon status. 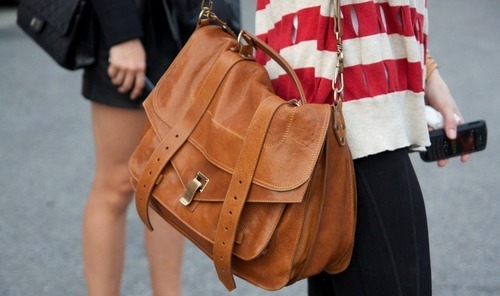 Sure it was the “it”-bag during its first year of fashion reign, but the bag that works year after year has the makings of a true classic. 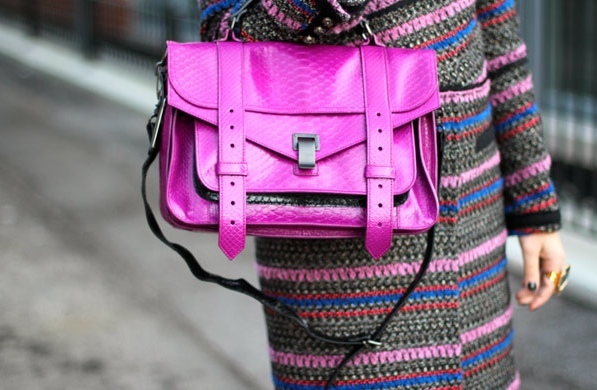 With multiple sizes, seemingly endless colors available, street-style and celeb-style inspiration galore, I was dying to get my hands on one of these babies. When a promising package arrived today at the front door (no less than a week before my birthday), my heart skipped a beat and my inner fashionista rejoiced. Just to back up a bit, this bag is everywhere. If you are an avid fashion blog reader or celebrity weekly reader, you had to have (at least once) come across a photo with a PS1 slung over someone’s shoulder, resting snugly on an outstretched wrist or tucked nicely under an arm. Even after several seasons and a follow-up PS11, this style was still high on many style-seekers’ lists — including mine. 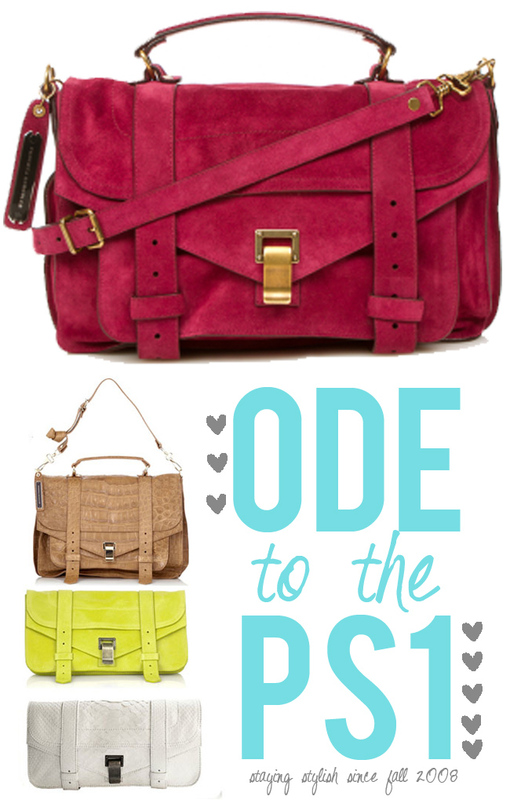 From a small pochette style to a medium bag to a tote to an extra large carryall, the PS1 fits any carrier’s need. I love these street-style shots with bright, vivid PS1s ranging from fuchsia to watermelon to yellow. Finally, here it is! My very own PS1! My wonderfully thoughtful hubby really outdid himself. He had flagged this little detail of my obsession months ago, waiting for the right occasion. What a guy! To maintain the timeless appeal and to fit the beachy casual vibe of where we live, he thought the classic white would be perfect and I have to say, I agree! Feel free to continue drooling, meanwhile, I will continue to walk on air! 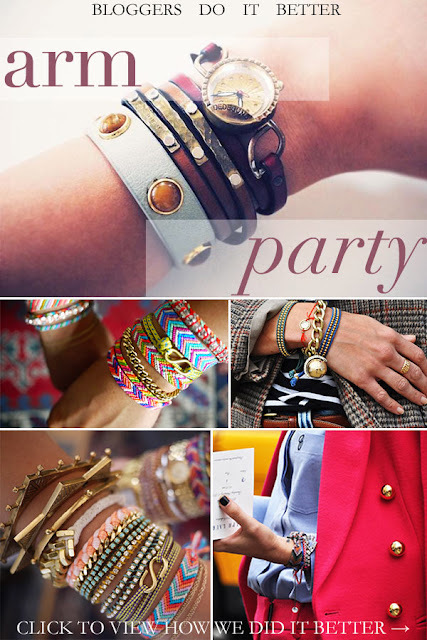 Arm parties are everywhere these days and you don’t have to be “on the list” to participate. It’s super easy to throw together your own and really, you can do no wrong. 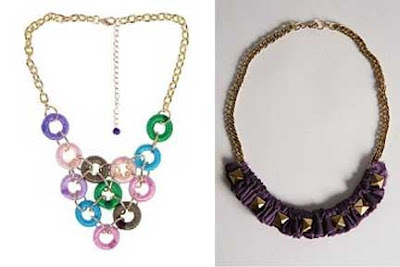 It’s all about your personal style and using whatever you have hiding in your jewelry box. 1. Survey the space. 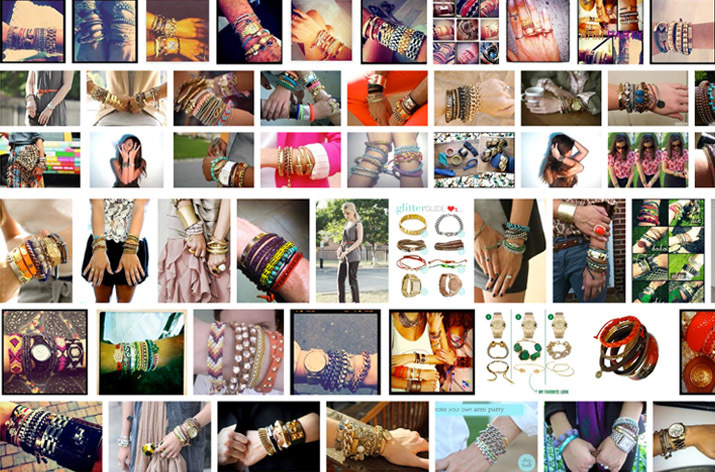 Lay out all the bracelets you have on your dresser. 2. Send invites. Grab at least five bracelets to hang out on your wrist, throwing them on in no particular order. 3. Mix it up and make it interesting. Don’t worry about who sits where or which ones match. 4. Put yourself out there. 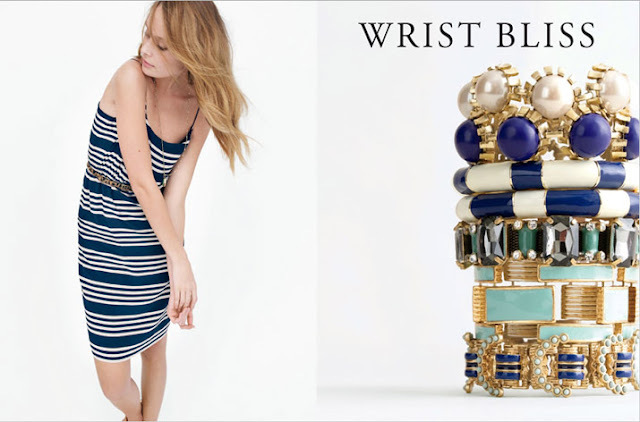 Rock the arm party with confidence. In case you need a little inspiration, here are some arm parties thrown by the fabulous people that invented them, the Man Repeller and Dannijo plus a few places to shop snazzy wrist wear on the cheap. Enjoy! 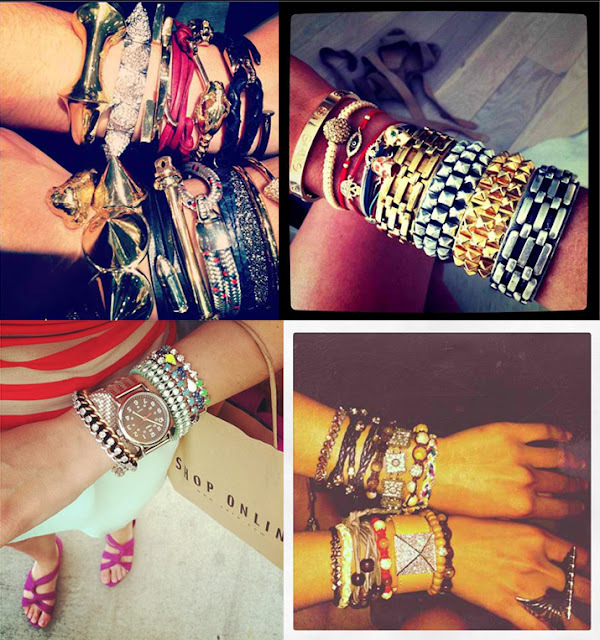 Here’s a lovely round-up of happening arm parties around the blogosphere, courtesy Pretty Shiny Sparkly. And finally, a few arm party shopping spots for the budget minded gal (Wanderlust, Forever 21) or not (ShopBop). Go ahead. Go a little crazy. Friends, I’m here today to confess the cold, hard truth. 1. Today was literally freezing. 2. I may be slightly obsess with the Easter Bunny’s fashion sense. But back to the first truth. This is not the balmy Florida weather I know and love. I was all bundled up like the kid in The Christmas Story in my new J. Crew coat, running hurriedly into the office or my car, escaping the cold to spend as few moments as possible in the chilly air. All I could think about was spring. Now that we’ve made the leap into the new year, the warm weather of late February and early March seems so close! It’s only a few short weeks away instead of what feels like a calendar year away, which means (drumroll please) sunshine and beach days and fresh salt air and joy! The first warm days of the year make everyone happy. There’s something about that ray of Vitamin A that brings smiles to faces, pep in steps and instantly lightens moods. I love it! 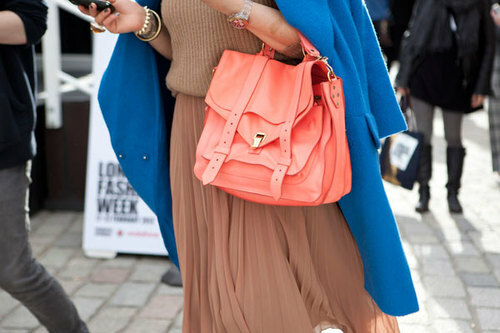 Just as fun as warm, sunny days are the cheery pastels of spring fashion. They’re so refreshing and a welcome change from the typically dark fall/winter palette. 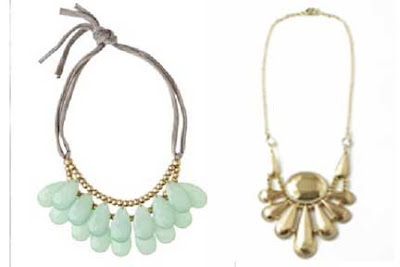 Here are a few I’m already daydreaming about that just might brighten a cold January day. 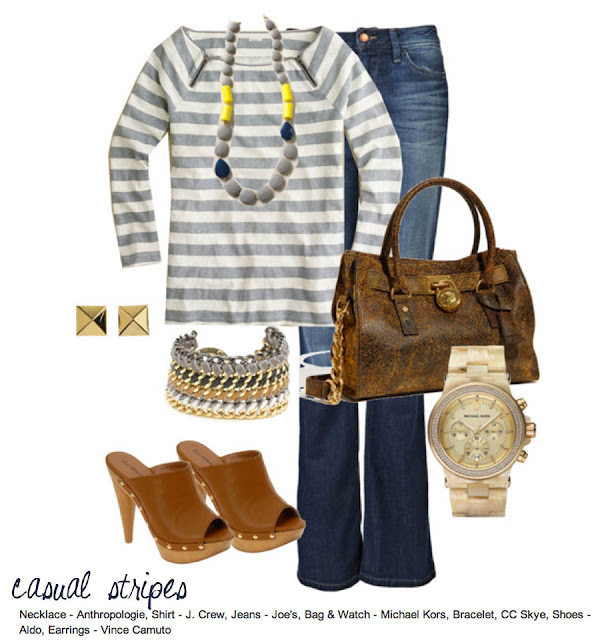 It’s casual Friday, arguably the best day of the week (hello weekend! ), and I’m loving this grey stripe/jeans look, complete with snazzy clogs, a friendship bracelet, a crafty necklace and the coolest Michael Kors bag I’ve seen yet. It definitely goes from work week to weekend fun. With the baby belly growing at what seems like an exponential rate, I’ve had more interest lately in fun accessories than anything else fashion-related. 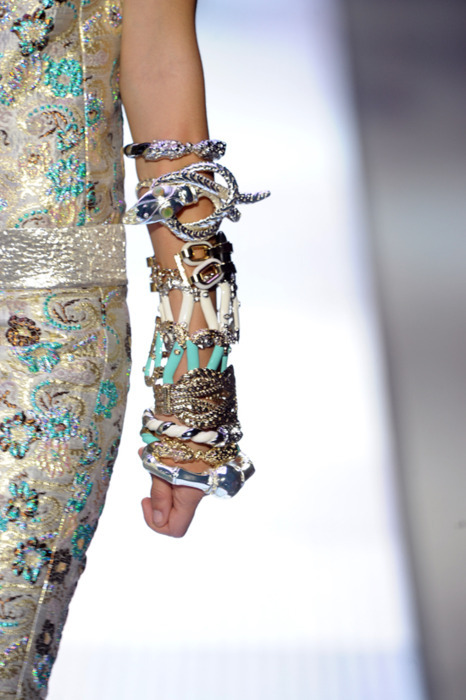 Even when my feet get too big for the shoes in my closet, a big necklace, chunky bracelet or watch always works. I spent my lunch hour today checking out the loot at the Fuss in Watercolor. I think I liked the accessories display just as much as the goodies themselvs. 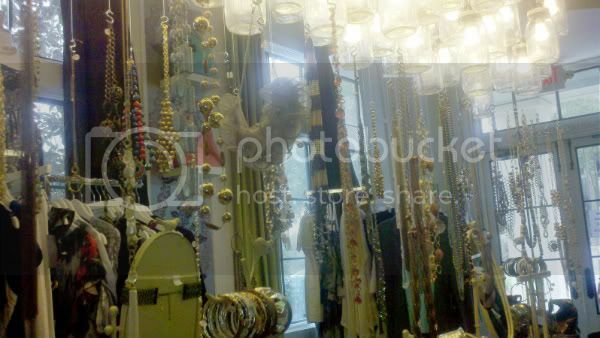 If only I could have a closet big enough to spotlight all my necklaces and such like this. 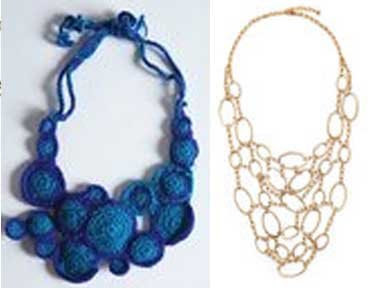 First of all, if you haven’t been shopping on Etsy, you’re totally missing out on tons of really cool hand-made products, lots of creativity and prices that are hard to beat. There are plenty of deals to be had on items covering every category under the sun. think of. Maybe it’s the nerd in me that loves online shopping. I don’t know. I openly admit to having a nerdy / geeky / dorky / clumsy / uncool side (which the fiance loves — or says he does). Little things like fonts, jargon, jokes that need to be explained, bookstores, computers and repeating silly movie quotes are…. well, the cheese to my macaroni. (And I love mac n cheese!). 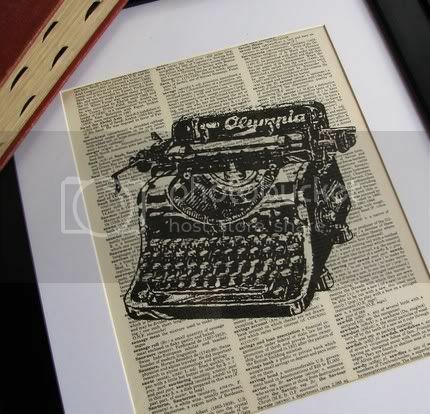 This vintage dictionary page with typewriter print by Little Blue Bird Studios would be perfect near my desk. After all, what nerd doesn’t need a good vocabulary? 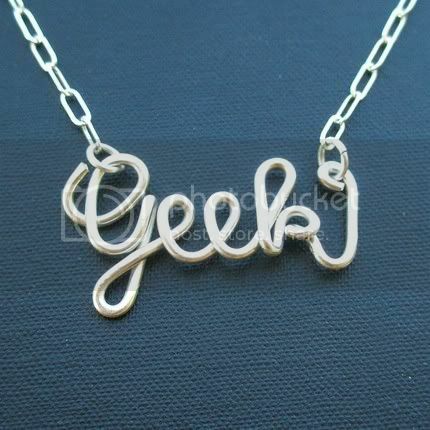 Why not beat someone to the punch and sport your un-coolness loud and proud with this necklace? 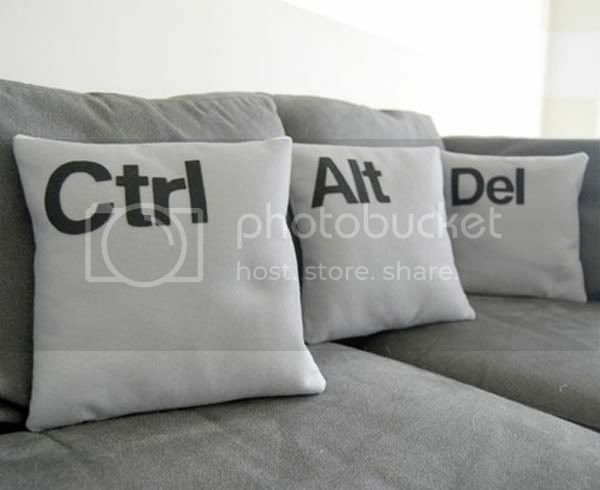 These Ctrl, Alt, Del key pillows are definitely geek chic! I would love them. Not to mention they’re Eco-felt (made from recycled plastic water bottles). 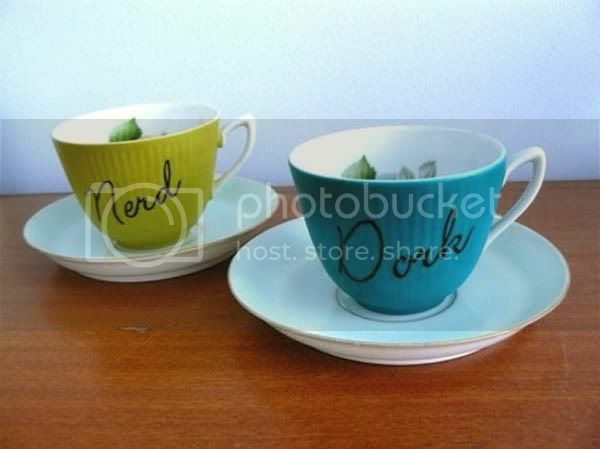 How cute are these “nerd” and “dork” espresso cups? 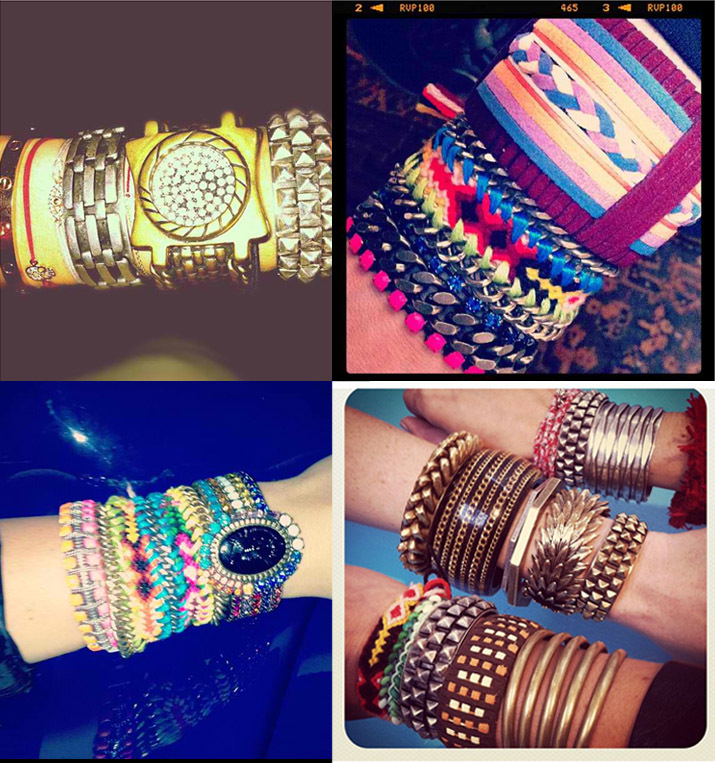 They would be the uber-cool touches to brighten a dull morning. P.S. If you want to take the geek test, go here. 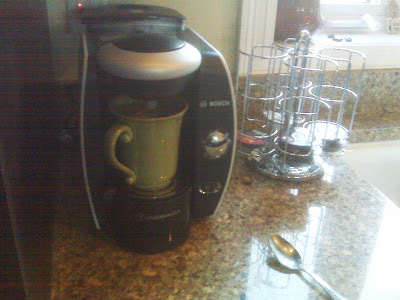 I was over at my friends Jason and Danielle’s house the other day and got to test out Jason’s new Christmas present – the Tassimo Hot Beverage System. It is one of the coolest things I’ve seen in a long time and now I desperately want one of my own. This mini machine magically makes everything from teas to hot chocolates to espressos to lattes and more, just with the touch of a button and about a minute wait time. You can buy the T-discs in all sorts of coffee brands and flavors — even Starbucks. 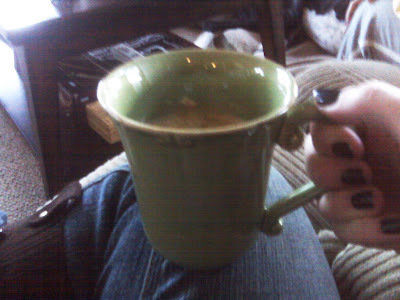 I tested the cappuccino and it took no time at all to make a frothy little taste of heaven. With the ridiculously cold freezing temperatures we’ve had here at the beach lately, this would be the perfect accessory for a cold morning or a chilly afternoon. 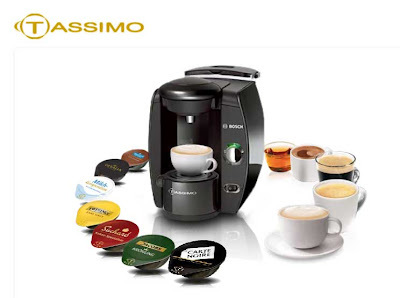 I even heard someone (who shall remane nameless) say “The Tassimo is awesome-o!” How can you resist that? Check it out at Bed Bath & Beyond here. P.S. The hunter green (not black) nail polish in the pic above is Here Today…Aragon Tomorrow from OPI’s Coleccion de Espana. Love it. Thanks, Mom. 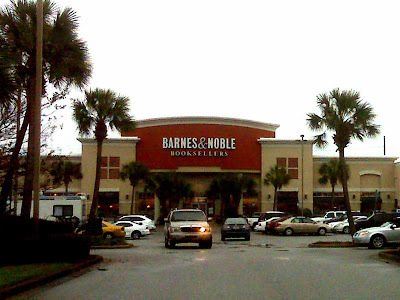 I stopped by the Destin Barnes & Noble today to pick up a 2010 Moleskine planner. I absolutely love these perfect little leather books. 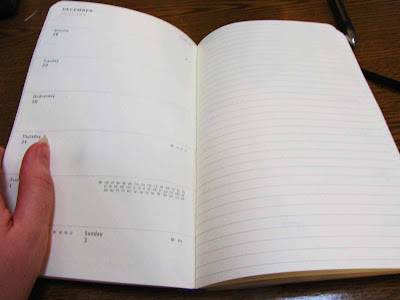 They make blank books for writing and sketching, lined books, graphed books, address books, even books with music pages and storyboard spaces. They come in tiny pocket sizes all the way large book sizes. 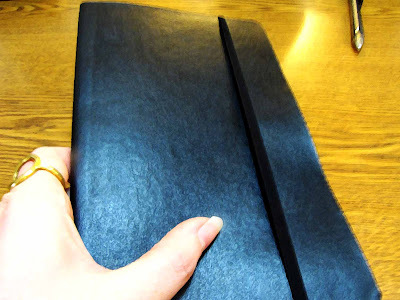 When I see all the black leather books organized shelf in the store, I just want to buy a stack, then fill them up with pages and pages of doodles, ideas, notes and appointments. All in thick black ink, of course. So today I purchased a medium size weekly planner (in black, although they’ve branched out in their cover color selection) and went right home to start adding to it. It was a very exciting day! Just think of what will be written in here! If you want to see more on Moleskines, go here. « I Love Amanda Suanne! 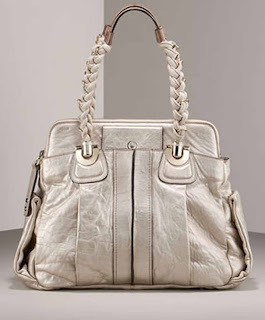 The Chloe Heloise Braided Strap Bag. In Silver. Available at Neiman Marcus for the bargain price of $2150. Sigh.